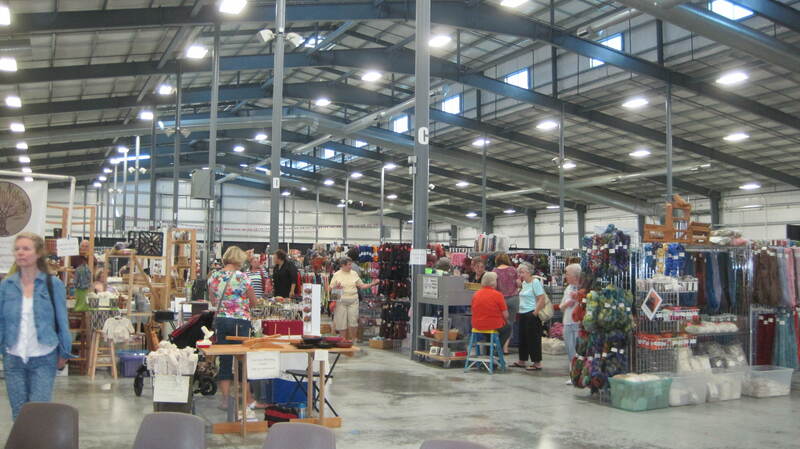 We, Marilyn (Pandagirl) and I (Luvswool), had never attended a “fiber fair,” so there were expectations and then the reality of the Fair. We had planned for many months to attend the annual Fair and met there early Friday morning with great anticipation. The advance program showed photos of sheep, fiber, workshops, art exhibits, bags of fleece, etc., and the Fair delivered all of that except for the sheep. One of the organizers explained to me that August is too hot for sheep, and I guess that makes sense. So, the only live animals were a lonely llama and a couple of angora rabbits. Still, it was an enjoyable experience. The Fair has been held for 8 years in Grayslake, IL, a far northwestern town in the extended Chicago metro area, and it’s a Fair that celebrates the work of many hands. We saw spinners, felters, and knitters demonstrating their crafts, and there were many workshops offered during the 3-day fair. There were a couple of folk singers and a few food vendors outdoors, but everything else was contained in an air-conditioned building. The majority of the indoor vendors were geared towards knitters, with many beautiful displays of hand-dyed, hand-spun yarns and goods. Neither Marilyn nor I are knitters, so we headed first for a walk around to scope out the lot. 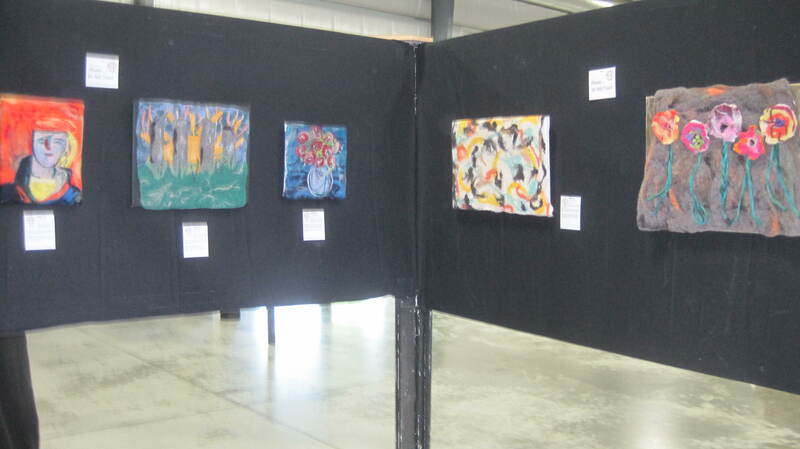 First stop was the Art Exhibit, which displayed fine fiber art–among them, my own display of five fiber wall-hangings. There were other fiber wall hangings, sculptures and “vintage” handbags (crafted from vintage patterns but otherwise entirely new). 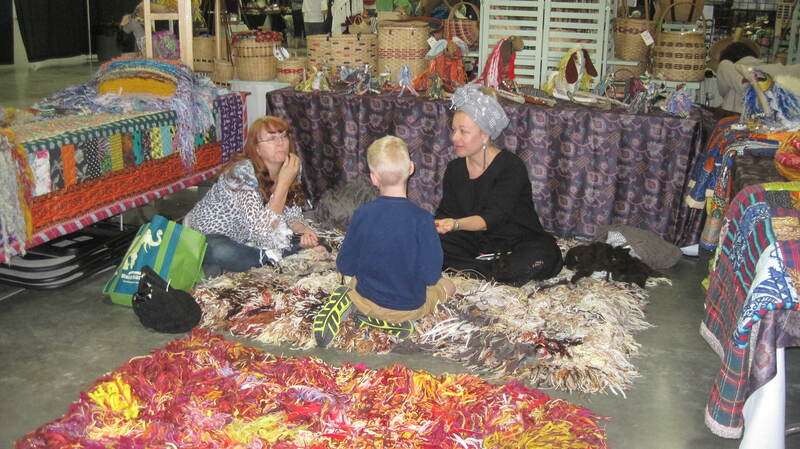 Next up were the vendors, which included some crazy rag rugs, lots of beautiful yarn and bags of alpaca fleece. 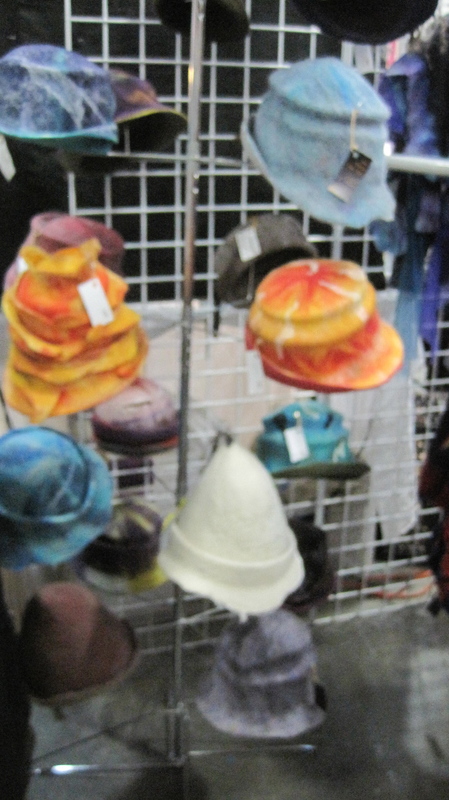 There were also felted hats and you’ll notice I didn’t snap pics of the roving, since I was busy buying it. Marilyn and I purchased some fibers we have not previously felted with–including Navajo churro, 100% Organic Polwarth, white Falkland and I bought some black Blue Faced Leicester with silk. Since there was so much yarn, I did pick up some white wool boucle for embellishment, as well as silk hankies, which I have never used. 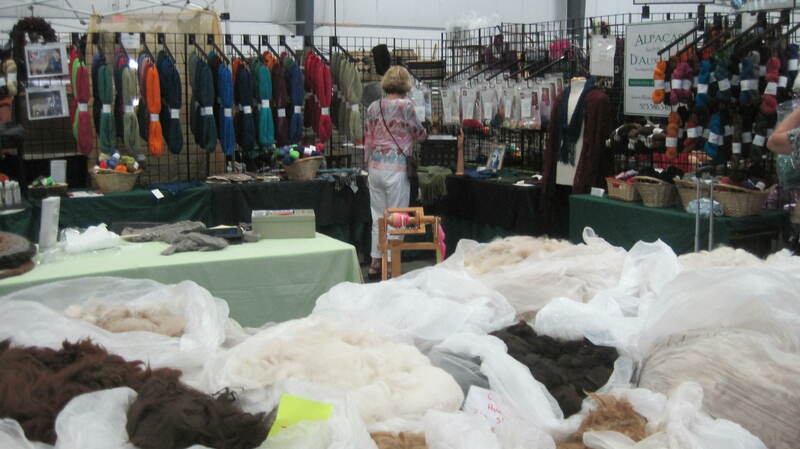 As we neared the end, we were able to view the judging of alpaca and llama fleece. Two judges followed a quality control checklist and had to concur on all points. 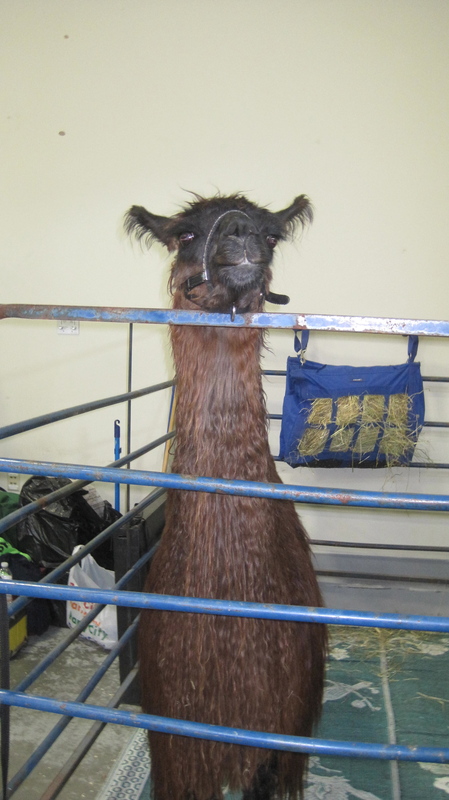 Then it was goodbye to Princess Athena, the lonely llama, and our day at the Fair came to an end. We would love to attend another fair, but next time would like to see sheep–sheep-shearing, sheep-judging, sheep fleeces, border collies herding sheep, etc. Maybe there’s a trip to New Zealand in our future! Bye! Thanks for stopping by. 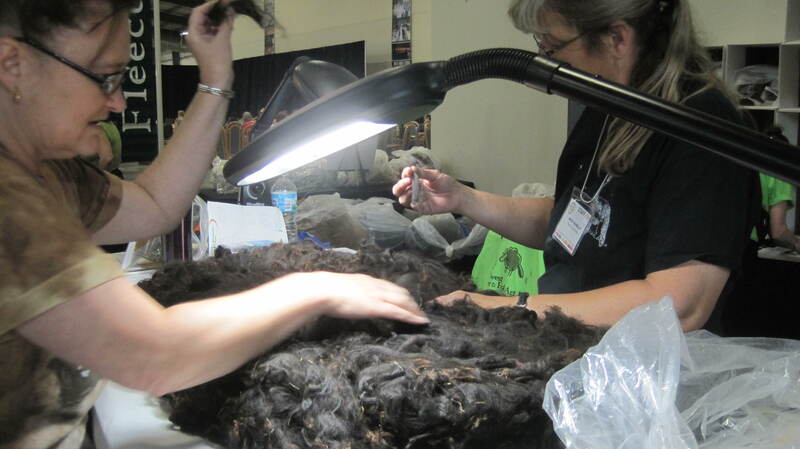 This entry was posted in Fairs and Shows, Guest Artists, Guest Writer and tagged alpaca, crocheting, felting, fiber, Fiber Art Exhibition, knitting, llama, Midwest Fiber Fair, quilting, sheep, spinning, weaving, wool roving, yarn. Bookmark the permalink. Your display of felted art looked great! The trouble with shows like this is that one’s purse (wallet) is never full enough – too many scrummy fibre things to buy. I hope you enjoy using and experimenting with your new fibres and that you show them on the forum. Thanks, Lyn. It was fun to see my art displayed for the first time! Have already started making samples with my new roving, such fun. It looks like you had a great day out 🙂 I would have loved to see all that fibre and fleece in person! We did, Zed. I am used to shopping for fiber on-line, but it was great to see so many choices up close. which is always the fist full weekend in May. It really is fabulous! Thanks for the tip, Margo! Marking my calendar. Thank you, Judy! It was a great day for art and so much fun to see what vendors were selling. I have heard about the festivals in Wisconsin and Michigan and would definitely like to attend another Fair, perhaps next year. Looks like you had a great day our looking at fibers. I am looking forward to seeing what you do with your new fibers Your artwork looked great hung up for all to see. I think if you want sheep shearing you need to go to a spring fair. See If you can find out a number or website for 4H in your area and ask them where they go with sheep and fleece. Ann, thanks…it was a great day and our first Fair, so would love to go to another, perhaps larger Fair. Still, it was fun to see the artwork and vendor offerings at our local fair. Thanks everyone! Cathy and I had a terrific time and it was really exciting to see her artwork displayed so professionally. We will definitely check out spring fairs, 4h and post our projects with our new rovings. Looks like a fun road trip. Cathy – I bet it was great seeing your work displayed. Did you get any comments on it? Looking forward to seeing what you do with your new wool. Thanks, Teri and Ruth. At the end of the Fair, the curator of the exhibit was telling me how much she enjoyed watching people watching my art work and commenting, which sounded quite favorable. I would have like to have been a little mouse in the corner! Always good to know what folks are feeling when they see your art. Very nice experience. It sounds as if Cathy and I will need to do a Fair tour! Thanks for the info Gigi! Ah, yes, seems there are quite a few choices of sheep fairs in the Midwest. Thank, Gigi! Thanks, Leonor…it was a thrill, to be sure, but also hard work!